Home Coffee Gifts 9 Piece Espresso Set – A Strong, Hot Gift! How about a housewarming gift that is hot and strong? Well at least the coffee that is served with this chic 9 Piece Espresso Set will be! This set includes a Primula Aluminium Espresso maker, 4 black & white demitasse cups and saucers. It also comes with a presentation gift box. This gift is ideal for a coffee lover or a new home owner who is more concerned with buying the essentials but who will appreciate having a nice coffee set to entertain guests in their new home. 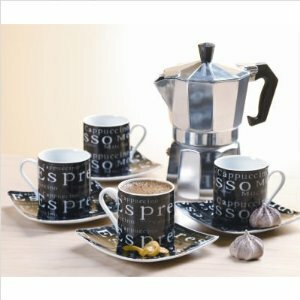 This 9 Piece Espresso Set is currently available here at 21% disount. Next articleAre You an Angel or a Devil? In Coffee Cups at Least!